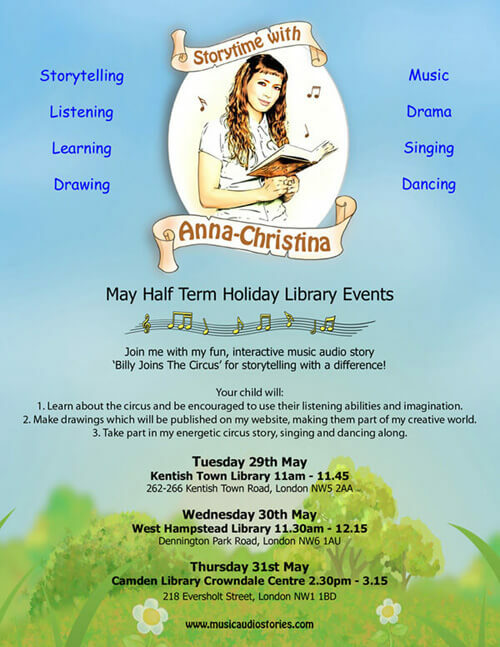 'Storytime with Anna-Christina' making waves at London Libraries! I felt so happy to be back, doing Story Time at London libraries during the May Half Term Holiday last week! I visited three libraries back to back with my circus story 'Billy Joins the Circus' and it was brilliant! This audiobook works so well, not only for teaching children about the circus but also for encouraging everyone to get involved with the singing and dancing. And it works! My first Story Time was with a lovely group of parents and children at Kentish Town Library. My favourite moment was at the end when everyone, parents included, were up on their feet, singing and dancing along with colourful wristbands on! I wish I had videoed that moment, it was fantastic! Next up was West Hampstead Library which was also a lot of fun and then I made my first visit to Camden Town Library. Everyone really enjoyed my story and I was so happy to see that one little boy called Leo, who took part in my Story Time the day before, had come back for more circus fun with me! 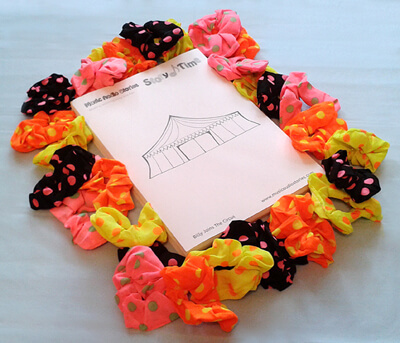 During my 'Billy Joins the Circus' Story Time, I invite children to practice their colouring in skills, as well as their drawing. I print out templates of "The Big Top" which they enjoy drawing on. I also offer them colourful wristbands to put on for the final part of my session where we sing and dance along with the audiobook. This helps them to feel like they've joined the circus and just adds a little something extra special for them to enjoy. More drawings from all of the libraries in the Kids Corner. Demand for my Story Time at London libraries is growing which makes me feel extremely proud. I am not able to do library visits every week or even every month. However, I will try my best to do more visits throughout the holidays and branch out to cover more areas in London. This was the first time I used my official story time brand name 'Storytime with Anna-Christina' to promote my library visits! I have begun a new Twitter page dedicated to all things Storytime with Anna-Christina so please follow me here: @StorytimewithAC. I'm also very happy to announce I am now listed on Wots 4 Tots where I can post all of my future Story Time dates. Woohooo!!! Well done to all of the children who took part in my May Half Term Holiday Library Events and big thank you to all of the staff at the libraries for being so lovely and helpful. Read about the idea behind this story, see videos and photos of the recording sessions plus read more about how I use this story in Story Time here: Billy Blog Post.